Taapsee Pannu is a bit disappointed these days after her name was dropped at the last minute from the remake of Pati Patni Aur Woh. Yes, the project that's making headlines for getting Kartik Aaryan and his girlfriend, Ananya Panday on board. The Naam Shabana actress was earlier a part of this remake and she was also the first actor to come on board. However, with the brewing romance between Kartik and his ladylove, the makers decided to cash in on their chemistry and drop Taapsee's name from the list. Of course, this is something that we believe and the producers haven't really confirmed the reason behind ditching the Judwaa 2 actress. Taapsee Pannu’s Badminton Team Member CONFIRMS the Actress’ Relationship Status! In her conversation with Mumbai Mirror, Taapsee reveals how excited she was to sign this remake as director, Muddasar Aziz had made some good changes to the original script. "I just wish I had known this a little earlier because I would have cleared my schedule. I had taken away dates from another film to accommodate the remake. I did it because I was keen on doing the film as Muddassar has contemporised the original story." Today when I finally picked a tennis racket it was in an ATP @maharashtraopen tournament along with some legendary players. This will be memorable and that’s not just coz I looked like the biggest fool on court ! 🙈 That’s @7acespune trying their hand at tennis ! Coz after all it’s all happening in our home town Pune! The sad part in her case is that she isn't aware of the reason why her name was dropped from the remake. The makers simply asked the director to take someone else in her place. And when Taapsee tried to get in touch with the producers, she wasn't given any proper explanation. The producers only tried to put this conversation off. 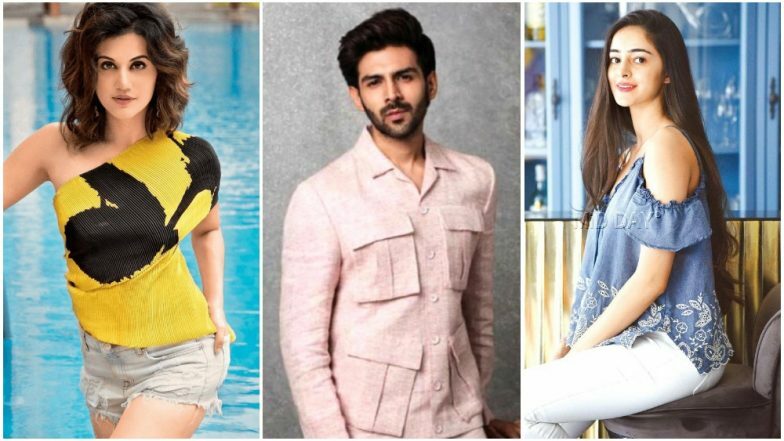 Ananya Panday To Play'Woh' in Kartik Aaryan's Remake of Pati Patni Aur Woh. Did the actress charge a hefty amount for this project? Well, the money factor wasn't even discussed for them to reject her for this reason. While she has no qualms about losing this project, she's upset because she wasn't informed about it. In fact, she came to know through others that she's no longer associated with the remake. Kartik Aaryan and Ananya Panday Are More Than Just Good Friends! Yes, They are Dating. Speaking about the role, the actress ensures it's a good part and she wishes good luck to anyone who comes on board for it. Now blame us for joining the unwanted dots but we do think Ananya's sudden involvement in this movie is courtesy of her affair with the actor and Taapsee had to pay a price for it.